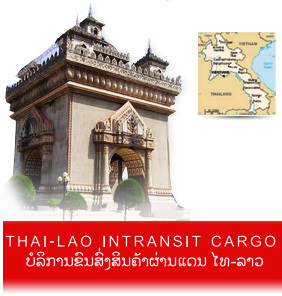 - Fully services for " Intransit shipment between Thai-Laos "
- Have our own office at Thai-Lao border. - Have our own office in Vientiane,Laos P.D.R. - Have our own trailer / truck for Inland & Internation transportation. - Have our own refer truck for Local & Thai-Laos transportation. - Low base truck for oversize, heavy cargoes. - Fully license for " Inland Transportation Company" issued certified by Department of Land Transport. - Fully license for " Internation Transportation Company " issed certified by Department of Land Transport. - ONE STOP SERVICES / MULTIMODAL TRANSPORT for any shipment to/from any countries in the world via Thailand sea&airport then to Laos by inland truck.